The decision to cancel the remainder of the Ooltewah High School boys' basketball season affects not only that school's current players, but nine other area teams as well. The Owls had 13 games remaining on their regular-season schedule, including home-and-away series with four opponents, but they will be forced to forfeit each of those now. The remaining schedule included nine total games against District 5-AAA teams (Bradley Central, Cleveland, McMinn County, Soddy-Daisy and Walker Valley) and four games against non-district opponents (one each vs. East Ridge and Red Bank, plus two with Hixson). The Owls, whose season ends with a 3-12 record, will not have to pay any financial penalty for cancelling games because none of the schools remaining on their schedule had signed contracts. "When a basketball schedule is made out, it's more of a gentleman's agreement that you'll play those games," Bradley Central coach Chuck Clark said. "We have had contracts with teams before, but never a team in our district. "None of us has ever had to deal with a situation like this. It's a no-win situation for everybody. There's nothing any of us can do to get that money back, but I doubt anybody would've even tried, considering the situation." 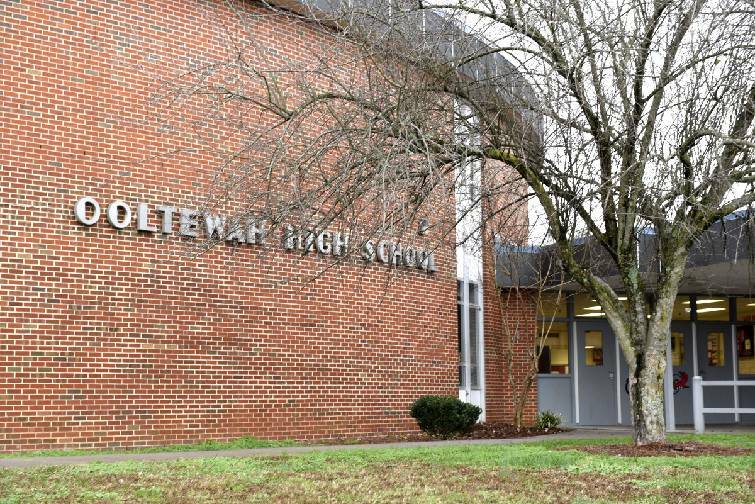 Ooltewah High School is photographed on Wednesday, Dec. 30, 2015, near Chattanooga, Tenn. POLL: Should Ooltewah's boys basketball season have been cancelled? Ooltewah's girls' basketball team will continue its season, as will the school's freshman boys' basketball team, although the Owls junior varsity boys squad also had its remaining games cancelled. The freshmen who had competed with the varsity will be allowed to play the rest of this season on the freshman team. Several coaches and administrators of schools that were on Ooltewah's schedule said that when the cost of paying referees, security and other game officials is factored in, they would likely lose money on the nights involving just girls' games. Once the regular season ends in mid-February, coaches of the other District 5-AAA teams will meet to determine the seeding process for the postseason tournament, which could be more complicated because of Ooltewah's cancellation. Bernard Childress, executive director of the TSSAA, said any student-athlete wishing to transfer — including from Ooltewah — would be required to give proof of a bona fide change of residence in order to be declared eligible at another TSSAA member school. Otherwise, any potential transfer would have to sit out for one calendar year from his last day of athletic participation or would be required to have his new school file a hardship request with the TSSAA. Childress said it would be unlikely that any Ooltewah boys' basketball player would be granted a hardship waiver of the transfer rule. "The decision has been made by the administration at Ooltewah to cancel the season," said Childress, who added he could not remember another TSSAA member school canceling an athletic season, in any sport, in his 22 years with the state's prep sports governing body. "I can't imagine our Board of Control would grant a player a hardship under these circumstances." Childress added that hazing is among the annual subjects the TSSAA addresses with coaches. "We talk with coaches before and during every school year and pass along information from the national level to our schools on dealing with hazing," Childress said. "We make sure our schools have the information in their hands, but unfortunately it still happens. "We will definitely use this (Ooltewah incident) as a reminder and an example of how important it is for all our coaches to take whatever steps are necessary to make sure hazing of any kind is not tolerated." Contact Stephen Hargis at shargis@timesfreepress.com or 423-757-6293.